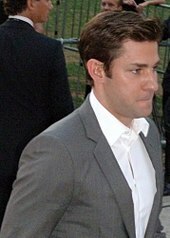 Before entering college, Krasinski taught English as a foreign language in Costa Rica. From there, he went to Brown University, studying theatre arts under Lowry Marshall and John Emigh, and graduated in 2001 as a playwright with the honors thesis "Contents Under Pressure". During his time at Brown, he was a member of the sketch comedy group Out of Bounds. In college, he also helped coach youth basketball at the Gordon School in East Providence, Rhode Island. Then he attended the National Theater Institute in Waterford, Connecticut. ^ "John Krasinski: Biography". TV Guide. Retrieved February 17, 2014. ^ "TIME 100: The Most Influential People of 2018". Time. April 19, 2018. Retrieved April 22, 2018. ^ Rutkoski, Rex (March 20, 2006). "Harrison woman has ties to 'The Office'". Pittsburgh Tribune-Review. Archived from the original on April 11, 2009. ^ Parade. "John Krasinski's Vacation of a Lifetime". Parade. ^ "Ancestry of John Krasinski". ^ Carina Chocano (November 1, 2012). "Charmed, I'm Sure". ELLE. ^ Tucker, Hannah (April 5, 2006). "Thinking Outside the Cubicle". Archived from the original on April 27, 2009. ^ "Class reunion: Schoolmates from Newton meet again in The Office". Boston Globe. December 6, 2005. Retrieved July 7, 2012. ^ "South Stage". South Stage. Retrieved July 7, 2012. ^ "Access Extended: Cosmo's Fun Fearless Male Of The Year Awards". Archived from the original on March 7, 2008. ^ "Brown University Library/All Locations". ^ Wilkes, Kayla (December 1, 2008). "'Sexiest' alum returns to Brown theater". The Brown Daily Herald. Retrieved June 15, 2013. ^ "The O'Neill National Theater Institute". Archived from the original on February 3, 2009. ^ Itzkoff, Dave (March 8, 2008). "Tackling Directing and George Clooney". The New York Times. ^ "FringeNYC 2002". Archived from the original on August 6, 2007. ^ April 19, 2000 episode of Late Night with Conan O'Brien where he met Rachel Weyer. ^ "Late Night with Conan O'Brien". NBC.com. Archived from the original on May 12, 2008. ^ Rice, Lynette (October 5, 2007). "'The Office' finally paying off... quite literally". Entertainment Weekly. Retrieved December 31, 2011. ^ "Smiley Face Movie Reviews". Rotten Tomatoes. Retrieved April 20, 2011. ^ "License to Wed (2007) – Box Office Mojo". boxofficemojo.com. Retrieved October 13, 2017. ^ "American Dad on FOX". TV Guide. Retrieved July 7, 2012. ^ "'Leatherheads': Semipro Life, By Kurt Loder". MTV News. ^ "2009 Sundance Film Festival announces films in competition". Festival.sundance.org. Archived from the original on March 11, 2009. Retrieved July 7, 2012. ^ "Movie Review – Away We Go". Rotten Tomato. June 5, 2009. Retrieved June 6, 2018. ^ "It's Complicated (2009)". Box Office Mojo. Retrieved April 29, 2010. ^ "Something Borrowed Movie Reviews". Rotten Tomatoes. Retrieved May 17, 2011.preetha's performance seem to enlighten the scene despite her small role. ^ Gholson, John (February 24, 2010). "The Reason John Krasinski Wasn't Cast As Captain America". cinemablend.com. Retrieved July 7, 2012. ^ "Big Miracle Trailer: Drew Barrymore and John Krasinski Save the Whales". New York. September 22, 2010. Retrieved September 23, 2011. ^ "Big Miracle: The real-life whale rescue which inspired new Hollywood blockbuster". The Mirror (UK). February 10, 2012. ^ "Krasinski To Lead New Indie Film". First Showing. ^ a b c "Nobody Walks". Variety. ^ Dan, Schoenbrun. ""BEASTS OF THE SOUTHERN WILD" TOPS SUNDANCE AWARD WINNERS". ^ Kit, Borys (October 19, 2011). "Matt Damon to Direct Warner Bros. Drama He Co-Wrote With John Krasinski". The Hollywood Reporter. ^ Bibel, Sara (April 30, 2012). "John Krasinski Hosts New Series Head Games Premiering June 3 on Discovery". TV by the Numbers. Retrieved March 8, 2013. ^ "Advance Screening of The Hollars with Producer Allyson Seeger Q&A post film". Retrieved June 4, 2018. ^ Stanhope, Kate (November 17, 2015). "John Krasinski, Stephen Merchant Animated Comedy Picked Up to Series at Adult Swim". The Hollywood Reporter. Archived from the original on November 19, 2015. Retrieved May 23, 2016. ^ "Lip Sync Battle – Overview". Zap2it. Retrieved May 11, 2015. ^ Rose, Lacey (May 8, 2015). "How NBC Passed on Jimmy Fallon's 'Lip Sync Battle' and Gave Spike a Hit Show". The Hollywood Reporter. Retrieved May 11, 2015. ^ Kuperberg, Jonathan (April 3, 2015). "'Lip Sync Battle' Breaks Ratings Records for Spike". Broadcasting & Cable. Retrieved April 25, 2015. ^ Craddock, Lauren (July 14, 2016). "Emmy-Nominated 'Lip Sync Battle': The 7 Best Battles (So Far)". Billboard. Retrieved July 31, 2016. ^ "EXCLUSIVE: John Krasinski on Not Reading Reviews and the Moment He Knew He Wanted to Marry Emily Blunt". Entertainment Tonight. Retrieved December 15, 2016. ^ "Cameron Crowe's Untitled Hawaii Project Delayed Until 2015". slashfilm.com. July 21, 2014. Retrieved March 25, 2015. ^ McNary, Dave (May 31, 2015). "'Aloha' Sinks Under Wave of Harsh Reviews With $10 Million". Variety. Los Angeles, California. Retrieved March 1, 2018. ^ Kroll, Justin (January 14, 2015). "John Krasinski to Star in Michael Bay's Benghazi Movie '13 Hours'". Variety. Retrieved January 15, 2015. ^ Kroll, Justin (January 14, 2015). "John Krasinski To Direct, Star In 'The Hollars' With Anna Kendrick, Richard Jenkins & Margo Martindale". Deadline Hollywood. Retrieved June 4, 2018. ^ "'The Hollars' Review: All-Star Cast Props Up Indie Grief Drama". rolling stone. June 4, 2018. Retrieved June 4, 2018. ^ "It's Dada Prada! David O. Russell on His Surreal Fashion Film for Prada". Vogue. Retrieved June 8, 2018. ^ Sneider, Jeff. "Kathryn Bigelow to Direct True Crime Drama About Detroit Riots for Annapurna". Retrieved February 9, 2016. ^ "John Boyega Joins Kathryn Bigelow's Detroit Crime Drama (Exclusive)". ^ Kroll, Justin (March 15, 2017). "John Krasinski to Write, Direct and Star With Emily Blunt in 'Quiet' Thriller". Variety. Retrieved November 17, 2017. ^ "A Quiet Place (2018)". Rotten Tomatoes. Retrieved May 27, 2018. ^ "A Quiet Place (2018)". Box Office Mojo. Retrieved June 3, 2018. ^ Andreeva, Nellie (April 24, 2018). "'Tom Clancy's Jack Ryan' Renewed For Season 2 By Amazon Ahead of Premiere". Deadline Hollywood. Retrieved April 24, 2018. ^ Skerry, Kath (March 29, 2006). "UPDATE: John Krasinski IS the Voice of Ask.com". givememyremote.com. Retrieved June 15, 2013. ^ "Esurance Debuts New National Ad Campaign". California. PR Newswire. Retrieved July 7, 2012. ^ Jones, Charisse (February 22, 2009). "Ad Track: Scandals tarnish celebrity endorsements". USA Today. Retrieved July 7, 2012. ^ "John Krasinski: My Coke Rewards Commercial". givememyremote.com. April 26, 2009. Retrieved July 7, 2012. ^ Gianatasio, David (January 6, 2010). "Arnold Bangs the Drum for Carnival Launches trio of spots celebrating shipboard family fun". Adweek. Retrieved July 7, 2012. ^ "More John Krasinski for Gap". Givememyremote.com. November 1, 2007. Retrieved July 7, 2012. ^ Koltnow, Barry (February 9, 2011). "Emily Blunt: 'Juliet' star not a humorless person". Retrieved June 15, 2013. ^ Oh, Eunice (August 28, 2009). "Emily Blunt & John Krasinski Are Engaged". People. Retrieved August 24, 2012. 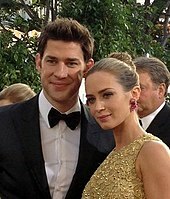 ^ "Emily Blunt, John Krasinski Wed in Italy!". Us Weekly. Retrieved November 1, 2011. ^ Eggenberger, Nicole (February 16, 2014). "Emily Blunt Gives Birth, Welcomes Daughter Hazel With Husband John Krasinski". Us Weekly. Retrieved February 16, 2014. ^ Schneller. "The quiet success of John Krasinski". Retrieved June 5, 2018. ^ "Alec Baldwin and John Krasinski's rivalry commercials". Retrieved June 4, 2018. ^ Noah Bierman; Boston Globe Staff (May 8, 2012). "Damon, Affleck, Krasinski hosting Elizabeth Warren fundraiser". Boston Globe. Retrieved October 5, 2014. ^ "John Krasinski to Narrate Disney's Nature Film 'Born in China'". ^ "American Ingenuity Awards, 2018". Smithsonian Magazine. Smithsonian. Retrieved October 31, 2018. ^ "TIME 100: The Most Influential People of 2018". Time. April 19, 2018. Retrieved January 19, 2019.